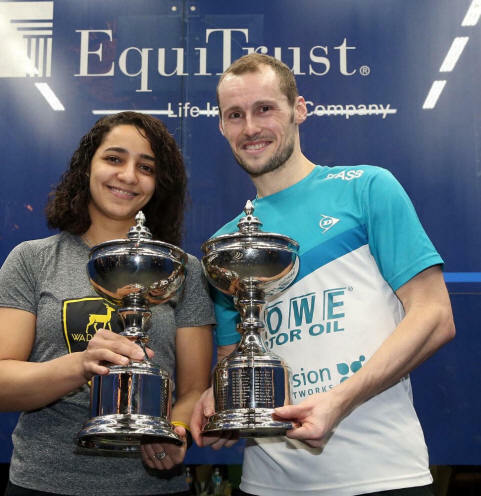 Raneem El Welily made it three Windy City titles in a row as she came froma game down to beat top-seeded compatriot Nour El Sherbini in the women's final, and Gregory Gaultier also recovered from losing the first game to deny Marwan Elshorbagy a first World Series title. At the presentation ceremony it was announced that the prize fund for next year's event will be raised to a record $500k, shared equally between the two events. Three Egyptians won through to the Windy City finals in contrasting fashions in Chicago. Women's top seed Nour El Sherbini was in devastating form as she came from a game down to beat Camille Serme in a battle between the world #1 and #2, while Raneem El Welily came through an all-Egyptian five-game thriller against Nouran Gohar. In anbother all-Egyptian matchup, Marwan Elshorbagy reached his first World Series final as he beat Ali Farag in four close games, while Gregory Gaultier ended the run of Borja Golan in straight games. Marwan Elshorbagy beat his elder brother Mohamed for the first time in PSA to reach the semi-finals, where he will met Ali Farag, who came from a game down to beat Simopn Rosner, in an all-Egyptian semi. In the women's top half world number one Nour El Sherbini made it seven wins in a row against Nicol David, while Camille Serme continued her 2017 unbeaten run with a 3-1 win over Alison Waters. The bottom half of the men's draw witnessed an even bigger upset as Borja Golan beat second seeded world champion Karim Abdel Gawad in four games, setting up a semi-final with Gregory Gaultier, who beat James Willstrop in straight games. The evening's women's matches went the way of the Egyptians as Raneem El Welily and Nouran Gohar beat Amanda Sobhy and Laura Massaro to ensure that the top four seeds contest the semis. THe second day of round two action in Chicage saw the quarter-finalists decided. There were no upsets to report as second and third seeds Karim Abdel Gawad and Gregory Gaultier won through, and they'll meet Borja Golan and James Willstrop in the last eight. In the women's draw the bottom half quarters will be Raneem El Welily v Amanda Sobhy and Nouran Gohar v Laura Massaro. Round Two in Chicago started with the top half of the draws, one big upset and a couple of escapes. Germany's Simon Rosner scored his second-ever win (in 11 attempts) against Ramy Ashour to set up a quarter-final against another Egyptian, Ali Farag, who survived a five-game encounter with Diego Elias. The other men's quarter will be another all-Elshorbagy affair after top seed Mohamed eased past Cesar Salazar while Marwan came through in five against Steve Coppinger, saying "I don't know how I won that!". No upsets in the women's draw as Nour El Sherbini, Nicol David, Alison Waters and Camille Serme set up two enticing quarter-finals. Round one was completed in Chicago with significant upsets for James Willstrop, beating eighth seed Omar Mosaad in straight games, and qualifier Leo Au, a five game winner over seventh seed Tarek Momen. Amanda Sobhy and Olivia Blatchford guaranteed a home quarter0finalist as they set up a last sixteen clash, wildcard Blatchford beating Joshna Chinappa in three, but the biggest women's upset came as Canadian qualifier Sam Cornett came from a game down to beat 9th seed Joell King. The main draw got under way in Chicago with a trio of epic top half encounters. 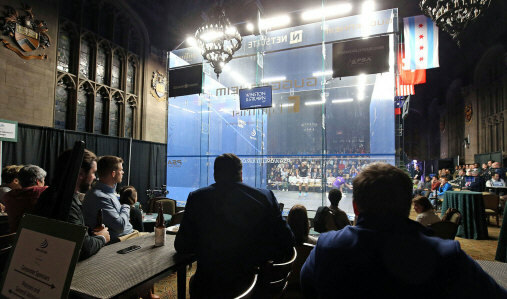 Top seed Mohamed Elshorbagy survived a 94m five-setter against Paul Coll; Steve Coppinger came from two games down to beat Cameron Pilley in two hours; Ali Farag won a see-saw five-setter over Miguel Rodriguez. 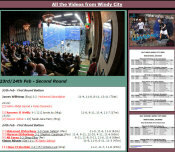 In the women's draw all the matches went to seeding until the last encounter, in which Tesni Evans came from 3-8 down in the fifth to beat Nour El Tayeb. 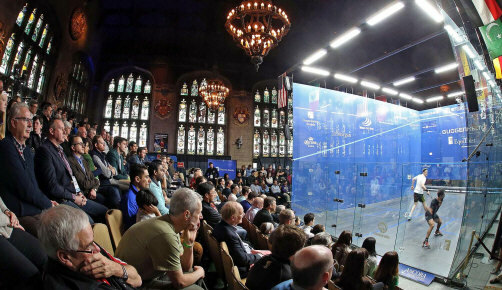 After two rounds of qualifying at the University Club of Chicago the main draws of the latest World Series event are complete, with three unexpected qualifiers in each of the draw. For the men, top seed Gregoire Marche succumbed to a comeback from Karim Ali Fathi veteran Finn Olli Tuominen beat second seed Nafiizwan Adnan in five, and British Nationals finalist Joe Lee beat yesterday's giant-killer Alister Walker to reach the main draw. On the women's side Nele Gilis came from two down to beat Rachael Grinham, Hania El Hammamy beat Millie Tomlinson in three, and Sam Cornett took out second seed Coline Aumard to advance.